LightBox: How are you using Instagram now, and how has it become a part of your professional practice? 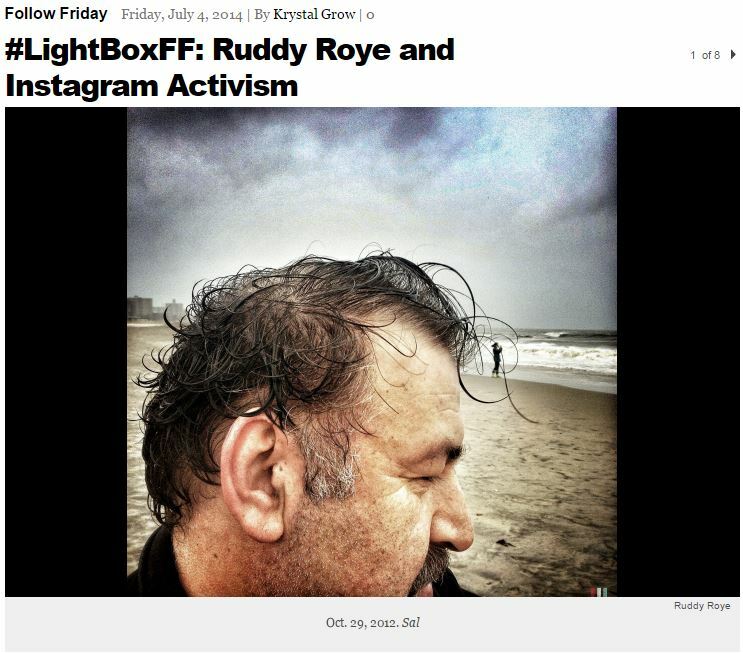 Ruddy Roye: Today I use Instagram as a way of keeping sharp and current. It is my way of staying visible and having a voice in a community that pays little attention to stories tailored from the African Diaspora’s perspective. I remember the days when I was knocking on doors and making calls to editors but to no avail, no one seemed interested in my personal projects. I do not really use Instagram as a means of declaration. It is simply the space that has allowed me to share my unique way of seeing. For me Instagram has become my amplifier. With it I am able to freely express my brand of photography without being told by the “gatekeepers” what to photograph. LightBox: What is the purpose of your feed? What does Instagram provide for you, professionally and creatively, that other platforms don’t? RR: The purpose of my feed is to express a feeling of invisibility that I have felt for most of my career. I have always felt irrelevant and voiceless. My Instagram feed is my way of talking about the issues that plague not just me but other members of my community. For me it is not so much giving voice to the issues – I don’t believe I am qualified – but rather an attempt to amplify some of the injustices I see in my community of Bedford-Stuyvesant [in Brooklyn, New York], the African American community and the diaspora. LightBox: Do you use any of Instagram’s filters or toning features? RR: I use a couple of filters. I think I have always felt that the digital platform was very malleable and allows for some degree of playing with and pushing. I like my colours saturated so I push the colours. LightBox: Which post inspired the most audience feedback and engagement through likes and comments? RR: I think the post where I took Gladys Castro to my family’s Thanksgiving Dinner garnered the most comments and interest. I think it was because people could identify with the idea of bringing work home, (I am smiling here) but seriously, a photographer once told me, about 13 years ago, that photography does not change anything. I have been trying to prove that photographer wrong ever since. Photography is a wonderful way of showing, of expressing, of seeing, it’s how we have always been gathering information and learning. Showing and learning goes hand in hand. Doing it just made sense. LightBox: When did you hit your stride with Instagram? Was there a moment where you crossed a threshold, and your perspective on the platform changed? RR: My mom has always told me to use any microphone put in front of me. And if I am ever lucky to get one, do not say anything stupid because it might be the only opportunity I will ever get to touch someone’s heart. Instagram came to me like that microphone. There was no one project. I started photographing the people I met when dropping off my boys to school. I think as I fell in love with showing these portraits and their stories, folks also fell in love with how familiar the stories were. LightBox: What other outlets did you have for showing/sharing work before Instagram? RR: Before my resources or outlets were few and far between. I depended on a few exhibitions, a few magazine jobs here and there, but the one constant was that I photographed almost everyday. Instagram allows me to share my photos so I no longer have to wait for someone to be interested in my personal work. Assignments are assignments but my personal work is not something I sit around hoping to get money for. If someone wants to buy a piece, of course I am willing to sell — but I won’t sit on the work because I am waiting for the monetizing of the platform. I am extremely happy that I can post an image that I feel burning in my veins for others to see and at the same time get a refill from seeing a friend’s post. LightBox: Do you envision Instagram ever loosing it’s appeal, and if so how would you replace it? RR: It’s inevitable in this fast moving technology for Instagram to lose its appeal eventually. In fact, the app Flipboard is already charting a course to nibble away at Instagram’s followers. It offers more than just a visual experience. You can browse all kinds of interests, like news, sports, fashion, shopping, all on a small screen. However, I think the people at Instagram keep coming up with innovative ways to keep their followers interested so we shall all see what happens in the future.